Childhood friends Adele Berne & Brooke Whiteside Pollard share their love of beach, babes and all things fun through their Poncho + Parker Collection. Founded in 2016 and out of necessity for a functional and fun cover up for their babes, they designed these ponchos to be carefree for the kids and functional for the parents all while staying fashionable and super chic. Poncho + Parker ponchos are made out of the original Turkish towel, which is extremely absorbent, light weight and quick-drying. Perfectly packs in a suitcase for vacation or easy to throw in a beach bag for the summer. We originally met Brooke at a fun summit in Palm Springs. While discussing our favorite brands and our love for NYC, it was there that we learned of their amazing brand Poncho + Parker. 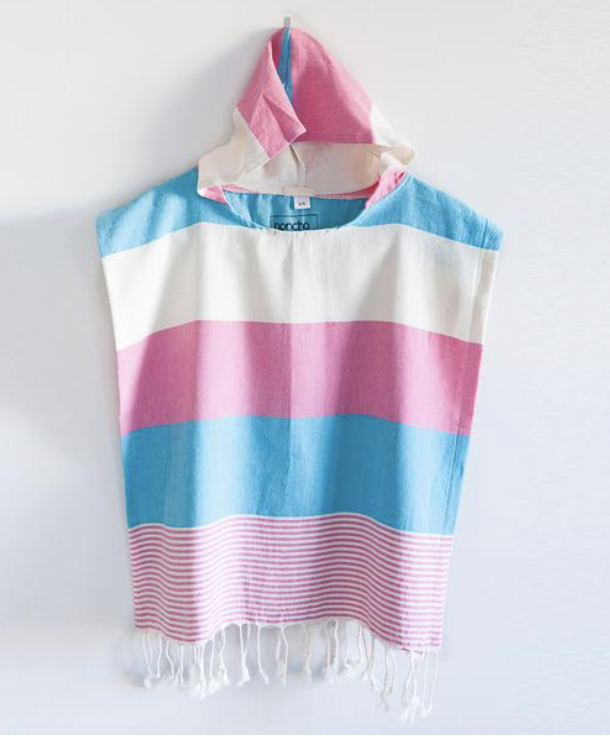 Fast forward to this summer and we've become completely obsessed with these ponchos. Our kids use them after pool parties, beach days and we even took them on our trip to Yosemite and rocked them through out the vacation. They are perfect for any occasion and have been great to keep in our beach bags. We recently spent an afternoon with Brooke and Adele, the founders of Poncho + Parker to get an inside look into their brand and what inspired them to start Poncho + Parker. Let's just say, we left completely inspired and grateful that there are people in the world like Brooke and Adele. They are kind, smart, passionate and always smiling. We know they are truly invested in making this brand a favorite in your household. How did you launch your brand? Adele and I have been friends for over 20 years and have always had an easy going friendship that easily translated into a partnership. The brand began over a bottle of red wine in the dead of winter in NYC, as were dreaming of our next seaside visit. Growing up on the coast, our hearts both beat for the sound of the waves. Now we that we both have little ones, we wanted to build a brand that exuded the carefree spirit that we experienced when we were younger. We launched about 9 months later with a brand that was both functional for parents and whimsical for kids. Chic yet practical. Stylish yet useful. The Poncho + Parker poncho was born. What inspires you? The coast. All things coastal... coastal colors, salty smells, fresh air, the way you feel when gazing into the endless ocean. Favorite Brands? A few of my faves are Olivia + Ocean swimsuits, Rose + Rex curated line of toys and Mignonne Gavigan jewelry. What app changed your life? Planoly. Hands down best app for planning social media posts, in particular Instagram. This one app has given me some of my life back. One tip? Be present. Whatever you are doing, whomever you are with, be present. Happiness is? Happiness is sitting seaside with a glass of rosé, my husband, two kids and goldendoodle on our favorite, tucked away, little island - Bald Head. Favorite go to gift for your kids, bestie or husband? I LOVE gifts! I am a huge gift giver and love every part of it, from curating to wrapping to presenting it to the recipeint. Children - Every year I make a board book of best friends for all my children's friends. It's a perfect birthday gift and a good way to remember friends at such a young age. Also, doubles as a way to learn letters and read names as they get a bit older. We love the board books from Pinhole Press. Husband - Every year my husband looks forward to updated pics for his office from Artifact Uprising for his little wooden block. They make the best rotating photo display! Dad - My dad LOVES a good tear-away calendar. And what can be better than customizing it with the hundreds of shots that we take of our kids? If you are like me, you tend to only use about 30 quality shots per year in frames/prints/etc... but what do you do with the other 300 (okay, more like 3,000!)? BINGO! Social Print Studio does such a nice job with these tear-away calendars and it’s a gift that keeps giving all year long, every single day! Hostess - One of my faves is this set of pineapple shot glasses, which we actually use as salt cellars in our house. With the pineapple being the symbol of hospitality and warm welcome, this gift just makes sense for the discerning host. What inspires you? The beach! I live and work right by the beach and try to get in as much sand & sun time as possible. Favorite Brands? Kids brands: Mini Rodini is awesome, their prints are outrageous and their sustainable message is admirable. I also adore Oeuf for playful knits and Bonpoint for those special pieces. For my own style I love to mix it up with vintage pieces, Marc Jacobs and Prada when I can. Biggest Challenge of running your business? Finding enough time in the day to do it all. I have another business I run with my husband, Epaulet so that is extremely important to me. And then of course family time with him and my daughter Josephine. Best advice you've ever been given? Be flexible. A part of being creative and successful is also responding to the changing world around you. What app changed your life? Kinda nerdy, but I love my banking app - makes transactions and keeping tabs on things so easy. And I'd be a fool not to say I love Instagram, staying connected and inspired to my community. Lastly Chatbooks is pretty awesome, an easy way to make photo books for our family. Favorite go to gift for your kids, bestie or husband? I love photo gifts, honoring a memory with a real print.